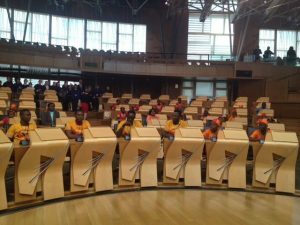 The Singing Children of Africa visited the Scottish Parliament building In Edinburgh on their tour in the summer of 2015. They performed a few songs and were shown around and treated very well. One of the tracks they performed was ” Flower of Scotland”, which is the Scottish National Anthem. The video of this performance went viral! It is certainly a different version from the traditional bagpipes. This track can now be downloaded and purchased http://www.cdbaby.com/cd/thesingingchildrenofafri …or search online, we hope you will support and enjoy.